Ties That Bind – Five years later, a group of contributors reunite for a book about race. The contributors spoke of harsh and remote racist parents, of black servants and nannies they adored, of relationships broken up to enforce segregation. They talked about their own prejudices, their silent complicity, guilt, ignorance, isolation and sorrow. Sometimes, joy. The book examined the costs of white privilege. It was published five years ago by Potomac Books, Inc. That’s five years in which it has moved about in the world, and inside people’s hearts. 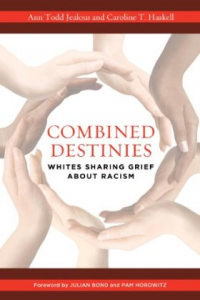 Jealous and Haskell have given presentations and workshops from California to Texas to Massachusetts, college teachers have used the book in their classrooms, and the duo has seen it open up dialogue. So they thought it was a good time to revisit some of those stories, and convene some of those storytellers—more than 20 of them—for a private reunion. One contributor was Judy Lewis, who coaches families on learning disabilities and co-founded Chartwell School. When she was a 15-year-old in Pasadena, she fell in love with a fellow high school student named Richard. He was strong, popular and kind, a star athlete, student body president, and black. It was the 1950s. “It had a profound impact on my life,” she says. “I was so proud of him, but there was no way to show that.” She had to steal away to secret house parties in which racially mixed couples could meet, dance and show affection: “I felt like a pioneer in my tiny little world.” She compares it to Doris Day’s song “Secret Love.” The relationship lasted four furtive and wonderful years before succumbing to the atmosphere of prejudice. But she has thought about that first forbidden love often, and cherished the opportunity to lend her story to the struggle for racial equality. JT Mason grew up in a liberal house in Ohio. Her parents were Oberlin College grads, avowed activists, and her mother founded the local Unitarian Church. But they also conveyed subtle messages that black people were inferior, that there were limits to their relations. Still, Mason grew up doing anti-oppression work, which she was ensconced in when Combined Destinies came out in 2013. “That horrible summer, we saw Trayvon Martin’s [killer acquitted],” she says. “I was at a  Trayvon rally when the massacre at the church in Charleston happened. Ann said to me, ‘You have to do more.’ Then Sandra Bland was killed. And that was it for me.” She called some friends and allies and they co-founded Whites for Racial Equity, dedicated to “dismantling racism.” She says their approach is not to shame people, but to invite them into dialogue and appeal to their heart. She is looking forward to meeting the other contributors at the reunion, many of whom she doesn’t know yet. didn’t want to be like that.” She says the premise of Combined Destinies, that racism causes damage to white people, wasn’t her own experience, and there simply weren’t any black people in her upbringing. Still, she’s interested in the reunion to see how Haskell and Jealous create a safe space for people to share painful memories.